I did a lot of research on how I could offer ebooks at live events. There are a few people who are so loyal to their eReaders, they wouldn't entertain the idea of purchasing a paperback. These readers insist that they will look you up online once they get home and will totally purchase your ebook, but there's no real way to know if they actually do. So instead of asking people to remember to check your website later, why not offer ebook copies in person? I had a few false starts when I was trying to figure out how to do this. At first, I thought giving out USB drives would work, but the price of purchasing a bunch of jump drives seriously cuts into potential profits. I also thought about burning my book onto CDs before having the realization that I don't own a single working CD drive and can't rely on customers having one either. This is the simplest solution I found and can all be done through the dropcards website. 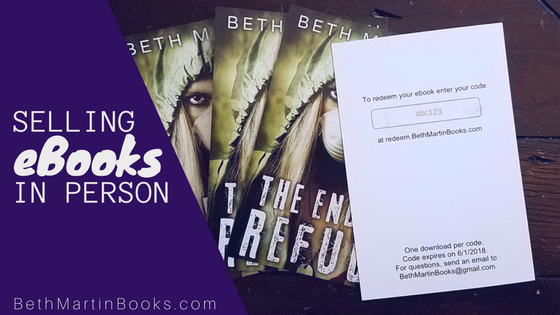 These are sturdy plastic cards the size of a credit card with a download code for your book. Simply upload your ebook and your cover, purchase a block of cards, and you're done. When readers purchase a card, they go to the dropcards website and enter the code on their card to download the ebook. The only drawback is the price. Unless you're buying 5,000+ cards, expect to pay about $1 per card. If you price your ebooks at $0.99, this method won't make any money. I personally decided to find a more affordable method for offering ebooks. The next two methods will require printing your own cards. I personally decided that I wanted to offer 4" x 6" postcards instead of a wallet card. Then, readers have something cool to take home with the book cover on it that has enough space on the back for an autograph (if I buy a book directly from an author, I want it signed). However, you can use whatever size you want. I bought my postcards through Vistaprint which is incredibly affordable. With a stack of beautiful postcards of my book cover, I just needed a method for readers to download my book. I used—and highly recommend—Card included. They have excellent customer service and the cost of hosting is very affordable since ebooks aren't huge files. It's tailored to music, so you'll want to input your pen name for 'artist or band name', the book title for 'album or song title', and your publishing imprint or self-published for 'label'. I purchased 1,000 download codes for only $10—very affordable. They send a PDF of printable cards along with a CSV containing all the download codes. What I did was purchase Avery labels. The software Avery offers allowed me to input the CSV file and presto! I had tons of little labels printed, each with a unique code. Then I just stuck a label on the back of each postcard. If you don't want to do download codes, you can just send digital copies purchased via email. In this case, collect the emails of every person who purchases the ebook (and ask if they would like to receive your newsletter!) then send them an email with your ebook attached. Even better, if you have a laptop and reliable internet during the sales event, you can send it at the time of purchase. Otherwise, just specify that they'll receive their book within 24 hours. I'm sure there are other ways to sell ebooks in person, but these were the best methods that I found. Do let me know if you try any of them!